The “Glass Bank” building was an outstanding representation of the region’s architectural link to the Space-Age and the optimism of the early 1960s. Please explore the categories below. If you have any images or reflections of the Glass Bank please contact us. Perhaps no community’s relationship with the space program resonates deeper than that of Cocoa Beach, Florida. Conveniently located just south of Cape Canaveral, it was home to many of the engineers and technicians who enabled humanity to explore the lunar surface. The First Federal Savings & Loan Association of Cocoa – Cocoa Beach Branch building was an outstanding representation of the region’s architectural link to the Space-Age and to the optimism of the early 1960s. Known to residents as the “Glass Bank,” the First Federal Savings & Loan Association building was designed by noted Sarasota School Architect Reginald C. Knight. Opening in 1962, this Mid-Century Modern structure of glass, steel and concrete stood out on the barrier island community of Cocoa Beach both because of its height and because of its elegant Space-Age design. 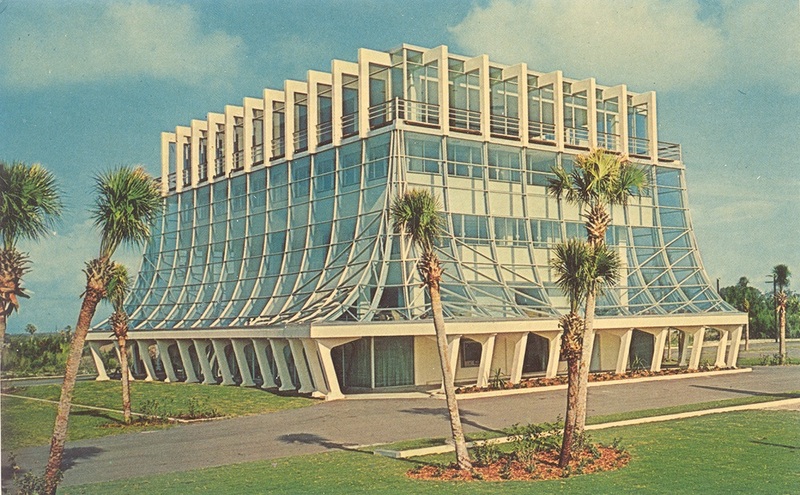 With a construction cost exceeding $750,000 ($6.1 million in today’s dollars), the Glass Bank would have been an impressive structure for a larger city like Ft. Lauderdale, but in a community the 1960 US Census revealed had yet to surpass 3,500 it demonstrated how business believed Cocoa Beach would continue to grow and thrive with each step to the Moon. The bank’s 4.5 floors of 20,000 sq ft offered mixed use commercial space – the savings and loan on the ground floor, mezzanine, 2 floors of office space and a restaurant on the top floor. While the Sky Room Restaurant would only survive one year, it was supplanted by Ramon’s Rainbow Room. The Rainbow Room offered fine dining and expansive views of the Atlantic Ocean, along with performances by many of the era’s Las Vegas headliners. To accommodate a need for additional seating, in 1965 the Rainbow Room would initiate a significant modification to the building by extending the restaurant’s walls to the edge of the white arches that had provided patrons an opportunity to watch Cape launches from an observation skywalk that encircled the fourth floor. Citizens made the mezzanine level a community focal point, where groups ranging from scouting to weight loss met free of charge. Because of its height and distinctive design, the building became a physical navigation point for the community – directions were given in terms of being north or south of the Glass Bank. During the first decade of operation, it was not uncommon for tourists to photograph the Glass Bank and request a tour. The significant reduction of NASA’s budget following the successful completion of Project Apollo’s initial lunar landing in 1969 would impact businesses throughout Brevard County, including Cocoa Beach. Vacancies began to appear on the Glass Bank’s second and third-floor offices which had maintained full occupancy during the building’s first decade of operation. Ramon’s Rainbow Room would close in 1970 and it was replaced by Marby’s Rainbow Room who would close in 1972 and end restaurant operations in the Glass Bank. Eventually, tourism and retirees replaced the missile and space industry and with it changed the commercial space needs of the city. This was reflected in the structure’s major modifications in the 1980s, as the fourth floor upscale restaurant space gave way to a law firm and aerospace office space was ultimately transformed into a fitness center. In an attempt to remedy some of its glass facade leakage issues, the exterior of the structure sported significantly less glass than it did in the 1960s and attorney Frank Wolfe would top the structure with a two-story penthouse condominium. In 2004, hurricanes significantly damaged the building resulting in the loss of all commercial occupants and bring a decade of structural decay. In spite of this, its demolition in 2015 would demonstrate the former significance of the Glass Bank to the community as crowds gathered to view its destruction and share stories of its glory years. 1961 – Structure Construction ends. 1962 – First Federal Savings & Loan Association of Cocoa – Cocoa Beach Branch officially opens. 1962 – Sky Room Restaurant opens. 1963 – Sky Room Restaurant closes. 1963 – Construction begins on external “Express Elevator”. 1963 – Ramon’s Rainbow Room opens. 1965 – Rainbow Room expands floor space by moving windows to the edge of the external catwalk. 1970 – Ramon’s Rainbow Room closes. 1970 – Marby’s Rainbow Room opens. 1972 – Marby’s Rainbow room closes. No other restaurant will occupy 4th floor. 1978 – Tornado damages Glass Bank. 1983 – Penthouse addition and stucco of exterior facade completed. 1983 – First Federal Savings & Loan Association is acquired by The First FA. 1985/86 – Reliance Bank occupies first-floor banking facilities. 1990 – Nautilus Fitness modifications. 1995 – Name change of lower floor banking facilities to Huntington Bank. 2004 – No tenants occupy the lower portion of the building. 2014 – City approves demolition. 2014 – Preparation for demolition. 2015 – Demolition of the building. It has been reported some browsers will not display the Image Gallery immediately. If you do not see the gallery, please reload the page and it will appear. We will be replacing this feature shortly. Thank you. Just prior to its demolition in January 2015, the ChronoPoints team conducted a laser scan of the Glass Bank exterior for digital preservation. The highly accurate laser scan point cloud data acquired provides for a digital representation of the building as it existed immediately before demolition and as a foundation to assist in the development of a 3D model of the structure’s exterior as it appeared in 1963. Historic images, documents, and oral histories enabled our team to model the interior of the First Federal Saving & Loan lobby, portions of Ramon’s Rainbow Room dining area, and Express View elevator. We are always seeking images of the Glass Bank and are especially interested in interior images of the offices, Ramon’s Rainbow Room, all phases of construction and nearby buildings. If you worked in the Glass Bank or visited it during its initial ten years of operation we would like to conduct a brief oral history with you. All documents are of interest. Please join us in completing our recreation of this Space-Age architectural wonder. ChronoPoints placed the 3D model of the Glass Bank and immediate surroundings into the Unity game engine. This enabled users to have a controlled exploration of the building and interact with artifacts on a traditional flat computer monitor. Additionally, a preliminary 360 virtual reality immersion experience was developed for the HTC Vive that returns users to the 1963 Glass Bank! 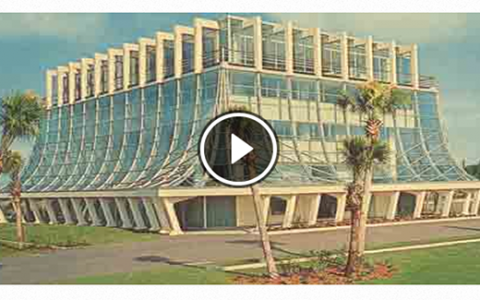 This video represents the first phase of the virtual recreation of the Cocoa Beach Glass Bank as it appeared in 1963 – the exterior of the building and basic ground floor. To enhance the model, we need your assistance – any photographs or your memories will enable us to add more floors and details. We are also interested in images of surrounding businesses. Upon receiving two Microsoft HoloLens units during Microsoft’s first HoloLens Academic Research Award competition, we developed an experience that enables users to explore the Glass Bank through Augmented Reality. Here, the Glass Bank can be superimposed over real world objects. Imagine there was a physical model of the Glass Bank on a table, you could walk around it and examine it from all perspectives, this can be accomplished virtually with an Augmented Reality unit like the HoloLens. But the interaction does not end with walking around, you can remove floors and walls, and with our experience redesign aspects of the structure utilizing today’s building materials. ChronoPoints developed a 3D physical representation of the Glass Bank with a partnering lab, PD3D, at IST. 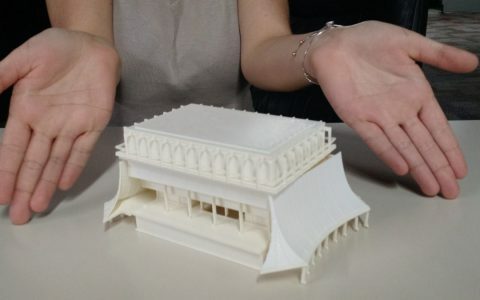 The model was printed on the X400 German RepRap printer. This 3D printed Glass Bank provides for an ‘exploded’ representation where the walls can be removed and floors separated. We thank PD3D for their support of the Glass Bank project. In November 2014 researchers from the Institute for Simulation and Training at the University of Central Florida conducted a laser scan of the “Glass Bank” in the City of Cocoa Beach. Constructed to be the home of the Cocoa Beach branch of the First Federal Savings & Loan Association of Cocoa, the structure clearly was a Space-Age calling card to the missile activities at Cape Canaveral/Kennedy just north of the city. The video provides images of the building during its heyday in the 1960s – including Ramon’s Rainbow Room. Florida Today photographer Malcolm Denemark produced this informative video on the Rise and Fall of Cocoa Beach’s Glass Bank. Digital Media students at the University of Central Florida produced this historical timeline of the Cocoa Beach Glass Bank. Thank you to all who contributed images for the timeline – if you have photographs pertaining to the building prior to 1980 please contact us. A montage aerial video of the Glass Bank and the demolition taken with a quadcopter.